Add Bluetooth 4.0 capabilities to a laptop or desktop computer through USB. The USBBT1EDR4 USB to Class 1 Mini Bluetooth Dongle lets you add Bluetooth wireless capabilities to a laptop or desktop computer through USB, with support for transfer distances of up to 50m (165ft).Compliant with Bluetooth 4.0 LE +EDR, the USB Bluetooth adapter offers data transfer rates up to 3 Mbps and low power consumption. This Bluetooth Smart Ready transceiver is an effective way to connect to a rapidly growing list of the Bluetooth Smart peripherals on the market, including the latest Apple and Android smartphones and tablets. Bluetooth v4.0 also integrates added security for all transfers using 128-bit AES encryption.A conveniently portable device, this ultra-compact adapter is unobtrusive when connected to your laptop, so you won't have to remove it each time you store your laptop in a carrying case or bag. The adapter is also backward compatible with previous Bluetooth standards (v3.0, 2.0, 1.2 and 1.1) to ensure connectivity with all of your Bluetooth devices. Compliant with Bluetooth 4.0 LE +EDR , the USB Bluetooth adapter offers data transfer rates up to 3 Mbps and low power consumption. 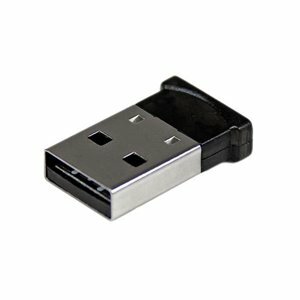 The USBBT1EDR4 USB to Class 1 Mini Bluetooth® Dongle lets you add Bluetooth wireless capabilities to a laptop or desktop computer through USB, with support for transfer distances of up to 50m (165ft). A conveniently portable device, this ultra-compact adapter is unobtrusive when connected to your laptop, so you won't have to remove it each time you store your laptop in a carrying case or bag.